If you have extensive mold and/or water damage in your home or business, please call 216-361-3473 to talk to one of our project managers today. Microbial infestations (bacteria) and/or mold (fungi) can quickly make a home or a business no longer functional and a health hazard. Water damage left unchecked can take its toll. If your home or business has been exposed to the elements because of a fire, flood, or plumbing emergency, your home should be inspected immediately by a certified mold remediator. It's important to catch mold damage as soon as possible to avoid possible foreclosure or tens of thousands of dollars in home rebuilding and remodeling costs. 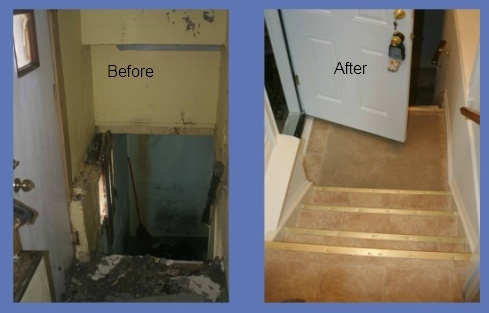 Mold remediation can involve a complete structural repair and rebuild of the affected areas, and should only be done by professionals certified in mold remediation. Our crews hold certifications from the IICRC, Restoration Industry Association, and American Council for Accredited Certification. Leading insurance companies in Northeast Ohio know who to call in the event of a mold emergency: Integrated Restoration. Now that my home has been restored, I want to take a moment to thank you and your company for what you have done for me. Nowadays you often hear people complain about bad experiences that they have been subjected to at the hands of both insurance companies and contractors. Well, I want people to know that my experience was quite the contrary. My home suffered major water damage this past winter. My furnace shut down during the winter. Every one of the hot water heater radiations, upstairs and down, froze and cracked. The plumbing lines froze as well. The water kept running. As I was out of the home for a bit of time, it appears that the water ran for about nine weeks before it was discovered. Perhaps you can imagine what water running for that length of time can do to ceilings, floors, walls, cabinetry, doors, windows, e.g. I could not have imagined the devastation. Like I said, I had a major water loss. From the beginning, the Travelers adjuster was nothing but helpful. The biggest help was when he immediately directed me to a local contractor who specializes in water damage repair, Integrated Restoration. From the moment I met Tom Stuckart at Integrated Restoration, I was confident that he and his crew would take care of my home. Once I gave them the go ahead, Integrated Restoration orchestrated getting power and heat to the property, immediately. The knowledge the staff exhibited in the technical aspects of drying out the house was reassuring. The high tech equipment that they brought in to do the dry out worked wonders. Within a few weeks, with Integration Restoration's assistance, I was selecting doors, windows, cabinets, trim, flooring and paint colors. My weekly construction meetings were helpful and informative. They allowed the project to move along and afforded me the project control I required. There were so many terrific things about working with these guys, the respect they showed for me and my home, their professionalism, the uniformed employees, the quality workmanship, the communication, the ability to work with the insurance company and the city, and the unbelievably quick turnaround, all made a disaster an otherwise "pleasant" experience.